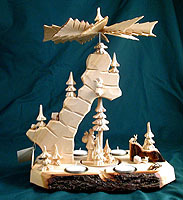 One cold February afternoon, as we were driving along a snowy country road deep in the Erzgebirge mountains of Germany, we saw a sign for "Schnitzkunst" (hand-carved art). On a whim, we decided to follow the narrow village road to the shop. 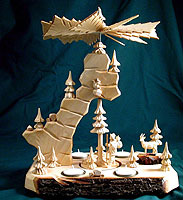 At the shop we discovered the most extraordinary Erzgebirge Pyramids we had ever seen. The attention to detail was amazing -- hand-carved figures, delightful animals, even the use of the rough bark from the tree from which the pyramid was made. We knew immediately that we had to bring these fantastic pyramids back home. And now they are available, for the first time ever, in the United States. 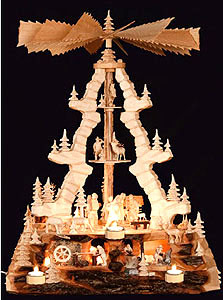 These pyramids are truly among the finest examples available of "erzgebirgische Volkskunst" or folk art from the Erzgebirge. Each pyramid is unique because it has been crafted by hand by the father and son team who own the shop. Because only these two artisans create these exquisite pyramids, only a limited number is available each year, and no two are exactly alike. 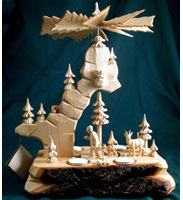 This father and son artisan team also create unique, hand-carved collectibles, shown below. Click on each image for a larger view. Because each pyramid is handmade, they may vary slightly from the photos. Very limited availability! 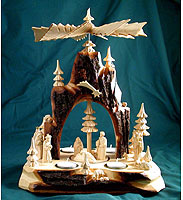 The hand-carved collectibles below, which are no longer made, are from the same artisan family in the Erzgebirge. We have a very small number left in stock, but once gone, they will no longer be available.